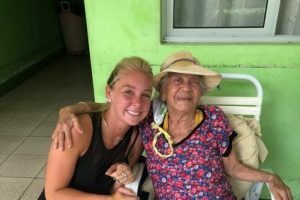 ‘My Time in Nicoya’ Daniel Rhoades '19 spent the summer immersed in the language and culture of Costa Rica. 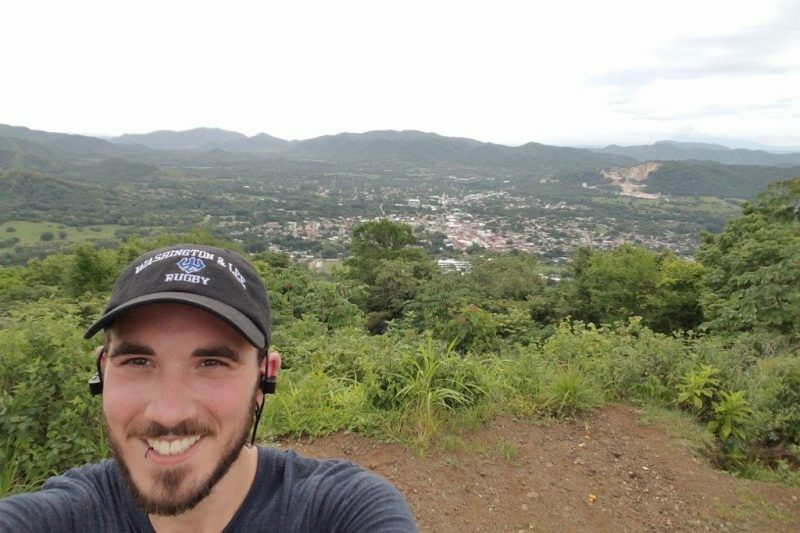 Daniel Rhoades ’19 snaps a selfie with Nicoya in the background. I had taken two Spanish courses, one introductory and one about Hispanic-American literature, but I wanted to immerse myself in the language. 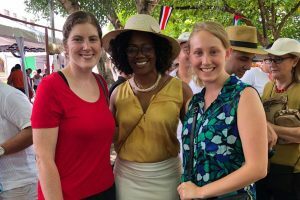 Fortunately, by taking a 2-credit EXP course, LACS 452 – LACS Practicum, the Latin American and Caribbean Studies Program connected me with an academy which provided me with firsthand exposure to the language and culture of Costa Rica. I had the wonderful opportunity to spend four weeks in Nicoya, Costa Rica, studying in an immersive language-learning environment. I got to know amazing people, was able to explore a beautiful countryside, and learned a lot about the culture of Guanacaste (the province in which Nicoya is located). I would wake up around 7 a.m. and eat breakfast with my host mom. It would generally consist of toast with pineapple jam, eggs, beans, rice and coffee. I would head next door to the academy around 8 a.m., catch up with the staff and students, and grab another cup of coffee. I would then work one-on-one with an amazing woman named Anky, and we would chat in Spanish about some topic of interest for an hour and a half. We would all take a break, grab another cup of coffee around 10 a.m., and hang out as a group for a bit. We would wrap up the morning classes with another hour and a half of conversation practice, and finish around noon. I would grab lunch in town either by myself or with another student, normally making sure to get a smoothie from a place with delicious fresh fruit. After lunch, I would volunteer with the other students at a nursing/retirement home from 1-3 p.m., playing games or just talking with the residents. Depending on the day, after volunteering, I would explore the town, go for a run, take a swim at the city pool, or catch up with friends from home. I would have dinner around 7 p.m., grab a snack from the supermarket if I felt like it before bed, and head to bed, on a good night, by around 10 p.m.
Did you meet anyone during the experience who became an inspiration to you? Anky was a loving teacher who I enjoyed chatting with every morning for my first three weeks. We talked about life, physics, politics, mental health and recovery, and just about anything that was going on with us. Aside from her, I felt honored to spend the time I did with the residents of the nursing/retirement home. I feel like there can easily be a lot of fear and isolation associated with age and death, so to be able to share that time and space, in what I hope was an open and supportive manner, was a real blessing. It was incredibly special and, honestly, a little difficult to put into words. What was the most challenging aspect of your time in Costa Rica? The most challenging part for me was cutting down on my English exposure. I realized early on that the more immersed I could become in the Spanish language, the more I would learn during my time there. Reviewing research, figuring out my fall financial aid, and maintaining other e-mail communication was more or less essential, but every time it made my brain switch over from learning to think in Spanish back to the usual English grind. That is to say, thinking in English and translating English thoughts, for me, is a bit different from learning to think and speak in Spanish. The nature and wildlife was absolutely breathtaking. I was able to visit hot springs, look from the top of a mountain over a bay leading to the Pacific ocean, and see howler monkeys in the trees behind the academy. Snorkeling and seeing a see turtle, doing the tallest bungee jump in South America, and driving through the mountains on some pretty rough roads was a great adventure. I was happy some of the other students encouraged me to go with them and break out of my comfort zone even more so. It’s funny, but what I like best about the location was the people. The people in general were just very warm, kind, and welcoming. Sure, I got a lot of looks as the next white person spending some time in Nicoya, but it didn’t stand between me and having genuine conversations. Moreover, I was there during the province’s annual celebration of their culture, so I was able to learn about making tortillas in the air, bombas (freestyle poetry, for lack of better words), and the importance of corn. I wouldn’t say this has necessarily impacted my future professional plans, but it has definitely made me want to go back and revisit Nicoya. I made a lot of good friends and only explored part of an amazing country. I would love to take my loved-ones with me and show them the beautiful country, people, and culture I got to know during my time in Nicoya.